Barbara McVeigh speaks about her recent trip to Guatemala in response to the immigration issues on our border. She also talks about her father’s stand for political honesty in 1981 and her passion film projects to take back her childhood dreams she lost under Reagan. In 1979, President Jimmy Carter, in a visionary move, installed solar panels on the roof of the White House. This symbolic installation was taken down in 1986 during the Reagan presidency. In 1991, Unity College, an environmentally-minded centre of learning in Maine acquired the panels and later installed them on their cafeteria roof. In A Road not Taken, Swiss artists Christina Hemauer and Roman Keller travel back in time and, following the route the solar panels took, interview those involved in the decisions regarding these panels as well as those involved in the oil crisis of the time. They also look closely at the way this initial installation presaged our own era. Four years ago Barbara McVeigh joined forces with film director Carlos Grana for a passion project which resulted in an international success featuring Dr. Sylvia Earle. The film shares the vital responsibility we have to our children, inspired by our children, to ensure they have a healthy planet. Narrated by Kimball Livingston. “My father is a federal criminal. My father is a hero,” Barbara McVeigh writes in her memoir Redemption: How Ronald Reagan Nearly Ruined My Life. Reagan fired her father for a union strike in 1981, leading him and 11,500 other families into years of strife. Just thirteen years old, she lost her dream to become an oceanographer, and her beloved guitar lessons, as her family struggled emotionally and financially for years. She blamed her father for “following his ego,” as her grandfather had termed it, and not placing family first. Reagan’s heroic public image soared as America was told how he combated the alleged threats of communism, nuclear war and the Soviet Empire. Thirty years later, Barbara marries and then takes up sailing at her late great uncle’s urging, himself a passionate and accomplished sailor, who had been her best friend, where she finds an unexpected connection to the ocean and freedom of the complexities of the modern world. When hard, bitter truths emerge about the ocean’s health and her fourteen-year marriage, Barbara packs her bags and leaves the illusory “good life.” She takes the helm of not one, but two film projects, one with the world’s paramount oceanographer Dr. Sylvia Earle, and the other with renowned Brazilian guitarist Jose Neto. She does this with no experience and virtually no money, to reclaim her childhood dreams and, in a desperate effort, to remind the world of the awe, beauty, and truth we must always stand for. During her projects she confronts the dark shadows of Reagan’s energy, labor, health, media, and environmental policies, revealing horrific truths about America’s so-called “Hero of the Republican Party.” She discovers that her father was NOT the federal criminal Reagan accused him of being. Instead, her father is a hero today. Barbara shares her very personal and painful family story of three generations and her search for truth that led her to China, Cuba, the Balkans, across Europe, and ultimately back to her own home, the San Francisco Bay. There she discovers herself, and what it means to be free in America today as our world faces political, social and environmental threats unlike any before. Barbara has a new dream and sees now that the spirits are guiding her, just as they had been, all along. 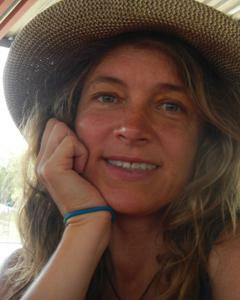 Barbara McVeigh is a writer, educator, filmmaker, radio host and environmentalist. She’s the mother of two children and lives in Northern California. Her one mission: to advocate respect for the natural world as we face political, social and environmental threats unlike ever before. FCC FREE Radio – Click here for interview. Lilycat of FCC Free Radio in San Francisco interviewed me on December 17. It was an educational, lively and inspiring conversation and we agreed – Time for Reagan and his cohorts to come clean. Reagan’s policies mirror Trump’s today and these policies have not only undermined our American democracy but they have nearly taken down an entire planet these last 30 years. Reagan didn’t just nearly ruin MY life. He’s nearly ruined YOURs and Reagan is the “hero” of the Republican Party, a gang of thieves. Barbara McVeigh is a filmmaker, radio host, author, producer and activist. Projects include documentaries Racing with Copepods and The Man Behind the White Guitar and books Redemption and Shattered Glass. Racing with Copepods is an ocean environmental film featuring world-renowned oceanographer Dr. Sylvia Earle. The small-budget film, which garnered extensive accolades, toured nationally with Wild & Scenic Film Festival. Kimball Livingston, international sailor and author who collaborated on the sailing film Wind, narrated Racing with Copepods. Barbara McVeigh is a local filmmaker and recent author. In her new memoir Redemption, How Ronald Reagan Nearly Ruined My Life, she relays a personal family story about how after 30 years of anger toward her father for striking against President Ronald Reagan in the 1981 PATCO strike, an act that labeled her father a federal criminal, she’s learned why her father and the fired 12,000 union members of 1981 should be considered heroes in America today. Barbara will show 30 minutes of the film The Road Not Taken (not available in the US) by Swiss Filmmakers Christina Hemauer and Roman Keller and talk about President Jimmy Carter’s wisdom, as we now understand his vision on energy policy and environment responsibility, at the most critical time of our global humanity today. And she will share the propaganda used by the “Hero” of the Republican Party and his entourage of big business that has led our country, if not planet, to a very dark road environmentally, politically, socially and economically. Ronald Reagan didn’t nearly ruin just her life . . . he’s nearly ruined everyone’s lives! Seating is limited, so please make a reservation at marinartists@hotmail.com with your name and email contact. Barbara’s book Redemption, How Ronald Reagan Nearly Ruined My Life is available on Amazon.com and signed copies will be available at the event. Podcast interview with Beyond Divorce author Jeannine Lee, about women’s empowerment, motherhood, sisterhood and environmental issues. Radio Interview – A Change of Course! Elisa Parker, host of the Wild & Scenic Film Fest Media Lounge interviews Carlos Grana & Barbara McVeigh of Racing with Copepods. *Film Trailer included at end of interview. Film Director Carlos Grana, Ocean Scientist Dr. Richard Kirby and Film Producer Barbara McVeigh talk plankton, oxygen and ocean health at ABC Hobart Radio in Tasmania for the Inaugural Eco Film Festival in Hobart, Tasmania.